Emil Sitka was an actor in Hollywood for over forty years who played hundreds of roles on stage in theater, on television, and in the movies. You may not recognize his name but if you've ever watched The Three Stooges, chances are very good you have seen him perform. Emil appeared in dozens of Three Stooges comedy shorts, as well as most of their feature films and TV shows, always playing different characters to contrast with and set up the Stooges humor. Emil is one of very few actors who worked with all four versions of The Three Stooges. Starting with original Stooges Larry, Moe and Curly in 1946, Emil appeared frequently during the Shemp years and the Besser period and then continued to show up throughout the De Rita era. Emil even came very close to joining the team as a Stooge himself in the early 1970's when Moe wanted to carry on with the act. By this time, Larry's health had forced him to retire so Moe asked Emil to join the group as Larry's replacement. Unfortunately, Moe's own health issues prevented them from ever filming the "fifth set of The Three Stooges" in action (see below). 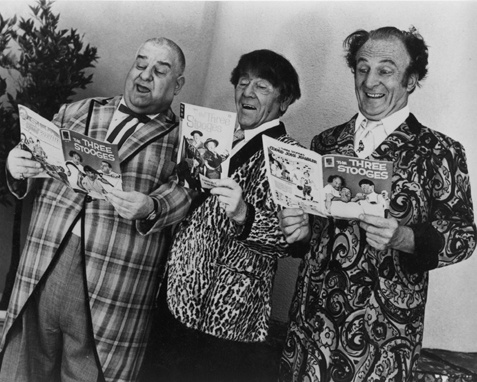 For decades after the last Three Stooge film images were recorded, Emil contributed to the legacy of the Three Stooges by representing them at numerous events and conventions. He gave frequent interviews and corresponded with literally thousands of Stooge fans. He assisted with efforts to put their star on the Hollywood Walk-of-Fame, and he contributed to quite a few notable Stooge books and video retrospectives. Up until his passing in 1998, he was fond of entertaining Three Stooges fans from out of town and welcomed them into his home. Emil Sitka was proud of his work with the comic trio, and he truly appreciated being a "small footnote in the history of the Three Stooges." Please take a moment to look around and learn more about Emil Sitka's life and Hollywood career. The Biography tells the unlikely story of an orphaned youth who beat the odds and achieved his dream of becoming a Hollywood movie actor. Or maybe hit the Stooge highlights for some fun pictures and videos. Or you can take a leisurely stroll back in time to the Golden Age of Hollywood by reading the stories of each of Emil's film roles in sequence to see what a working actor actually went through. You'll see that, besides being a "fourth stooge," Emil did a lot of work with other stars as well, and he ended up participating in a wide variety of shorts, feature films and television shows that now makes for an interesting cross-section of Hollywood history. There are many rarely-seen pictures and posters in the first film section: (1946). Click on a title to see details from Emil's List of Films, a personal journal in which he logged nearly all of his film work. And once you've started you can click <-- or --> to move consecutively from one film role to the next. Many include a short essay that expands on Emil's experiences, some of which include his very own, very personal diary entries for the days he worked, providing a unique perspective you won't find anywhere else. I suggest you start with Emil's very first movie acting job in HISS AND YELL (1946). If you have any comments, questions or suggestions, or if you find any typos, factual errors or broken links, please let me know through the Contact Us page. It would be very much appreciated. Thanks! My name is Saxon Sitka and Emil was my father. It is my pleasure and my honor to present this tribute to his life and acting career. Throughout his life, my Dad wanted to make people laugh. If you find something to make you smile while visiting EmilSitka.com, then this website has served it's purpose. De Rita, Moe Howard, and Emil Sitka, was never filmed in action. The short video clip below was posted on YouTube by a fan.